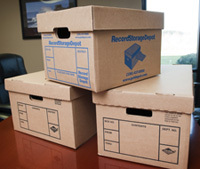 Selecting the proper box for storing information is almost as important as choosing the right records management provider. Sturdy and properly designed containers secure your confidential documents, files and backup media and ensure safe transport and handling for long term storage. Be cautious of low cost inferior cartons that are easily torn, crushed, or worn down which do not hold up for off-site storage. To place an order or to get more information call us at 336-437-8500. See below for our range of boxes with size dimensions. and building plan/map boxes and other custom sizes for special projects.